The Department of Defense is spending more than three-quarters of a billion dollars to buy Russian-made aircraft for an Afghan aviation squad that lacks the troops and expertise to operate or maintain them. We know about this example of Pentagon waste because the Special Inspector General for Afghanistan Reconstruction (SIGAR) recently uncovered it in its report to Congress. This is just one example of the important work performed by inspectors general across the federal government. While IGs at the Internal Revenue Service and the General Services Administration have uncovered some excessive spending for team-building conferences, these “scandals” pale in comparison to the corruption, fraud, kickback schemes, and bribery uncovered by IGs looking into the wars in Afghanistan and Iraq. Thankfully, the SIGAR and the Special Inspector General for Iraq Reconstruction (SIGIR) have recovered hundreds of millions of hard earned American taxpayer dollars because of their investigations. However, these inspectors general are temporary offices and analyze only two of the dozens of countries in which the US military operates. As the US engages in more military actions, whether in Syria, Mali, Pakistan, Yemen, or Somalia, we have no permanent office for oversight, no permanent special inspector general to provide critical transparency and accountability. These “overseas contingency operations”, as they are officially called, may well experience the same kinds of corruption and kickback schemes that the Afghanistan and Iraq wars witnessed. Except this time, there will likely be no inspector general to investigate, prosecute and bring the perpetrators to justice. That is, unless we do something about it. The American people should waste no time in calling for accountability and demand a special inspector general for overseas contingency operations, or SIGOCO, to oversee the hundreds of billions, sometimes trillions, of dollars going to US war efforts. Too much “emergency funding” has been pumped into war zones, with little to no opportunity by Congress, let alone an inspector general, to perform oversight. This has to stop. If the American people think government spending on conferences is bad, take a quick look at Afghanistan. Late last year, a US army staff sergeant was charged with smuggling $1m in cash inside numerous DVD recorders loaded for shipment to the US. Another US army sergeant pled guilty to smuggling $100,000 in a backpack at the end of her overseas tour, while a former US army chief was convicted of conspiracy for his role in a bribery/kickback scheme, after soliciting a $60,000 bribe. Afghanistan war profiteering is ubiquitous. A US army sergeant first class stole $225,000 in funds earmarked for reconstruction. A US army 7th Special Forces group sergeant stole tens of thousands of dollars hidden inside a teddy bear. The convictions are constant, the charges are countless, and the monies lost are by now in the billions. But don’t take our word for it, read the SIGAR report. Iraq was even worse. The now-infamous Anham, a defense contractor that made millions off the Iraq war, charged US taxpayers $4,500 for a circuit breaker that cost only $183 at an appliance store, $3,000 for a separate circuit breaker that cost $94, and $900 for a control switch that cost $7. DynCorp was also investigated by SIGIR for inflating claims for the construction of container camps. To its credit, SIGIR reclaimed $7.7m from the company and another $1m from its subcontractor, the Sandi Group. These Iraq war stories are pervasive. A US Army sergeant was indicted for taking more than $170,000 in bribes from defense contractors and laundering up to $250,000 through bank accounts in Kuwait and the US. A former US Army major pleaded guilty to bribery, funneling $250,000 to an account in Los Angeles. Another former US Army major was found guilty of money-laundering, after admitting to the receipt of four wire transfers – at $100,000 each – and the creation of a sham agreement with contractors to conceal the payments. And a US Marine Corps contractor officer helped launder approximately $150,000 in bribes from contractors in Iraq. In all of these corruption cases, had there not been a special inspector general on the scene, these Pentagon employees and defense contractors would’ve made off with millions of US taxpayer dollars. The problem is, these inspector general mandates are short-lived. 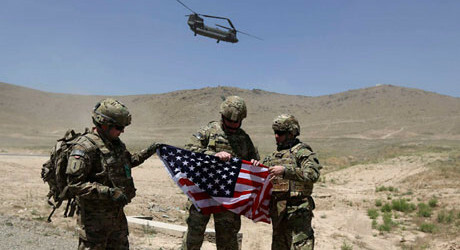 The SIGIR mandate in Iraq expires this year and the SIGAR mandate in Afghanistan, which started years after the initial invasion, will end shortly, as the US winds down the war in Afghanistan. The question remains: who will monitor US military efforts elsewhere, from Syria to Somalia, from the Persian Gulf to Pakistan? There are billions of US taxpayer funds floating around overseas, unmonitored and unchecked, ending up in teddy bears, DVD recorders, and illicit bank accounts. Unless we do something about it, the corruption will continue. The time is now to make permanent this oversight of overseas expenditures before another American dollar is wasted. Does the U.S. Have a Moral Imperative in Syria?